Let's face it... Titans are just cool. On the heels of the FTW Apocalypse post, fellow FTW member Barjack's Shadow Company was gracious enough to forward a few cardstock DIY Titan Templates to me. After a quick email to the creator for permission, I've got them posted here for everyone to enjoy. For inspiration alone, fellow FTW member Vassal40k was kind enough to pass along a link to Tanks and Trolls. This guy has got some incredible Titans in his gallery. An amazing scratch built, clay sculpted Eldar Revenant Titan. A comprehensive step by step through the whole process of building a FW Reaver Titan with lots of tips and tricks. 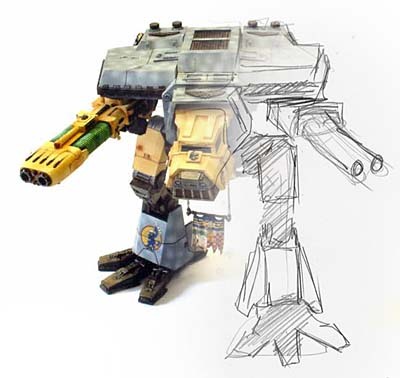 Follow these guys as they start the process of building a FW Reaver Titan. A near complete Titan with some great freehand work and subtle painting. A project underway with some amazing detail painting inside. If I missed your Titan project, I apologize... send me an email or leave a comment and I'll get you added here. Those titan plans look pretty cool. Anyone know what density of cardstock to use? I think my wife even has a scoring tool from scrapbook I could maybe use. Seconding eriochrome's request; any idea what density of cardstock? Thank you, I have downloaded some pdfs for future perusal. It's my job to make the hobby a little more difficult for you guys. I think if I were to build one of these fellas, I would use cereal box cardstock, matt board (stuff around pictures in frames) and maybe plastic signs (the kind you can find at the local hardware store... the poor man's plasticard). We will be kicking off real soon. Almost done on my warhound... wait... I didn't tell any of you guys I was working on one did I... HEHE! Hooooly crap I'm saving every cereal box I get from now until forever for Titan construction. Heh heh... who's afraid of the newb Guard player NOW? Sorry about the late reply, even though I had a hand in this. Paper: Regularly available thickness sturdy but not poster board, cereal boxes are a good pick. Styrene: Anything from 1mm and thinner for details. In some cases I have used anywhere from 1/8th inch thick pieces for base structure if I need to use pegs and pinning to hold up the model. Wood: I use balsa, it’s lighter and sometimes easier to work with if I need to bang out a quick model, or mock up but allows for a lot of carving and shaping, great for eldar vehicles lots of curves. From my experience with two war hounds and other builds I have done with plans like these. The plans are intended to be used with card stock just general buy in 100 or so sheet packs, stuff you get at any office supply store. My first mock-ups were always in a cheap material such as card stock or cereal box cardboard, you can also get this at hobby stores its called chipboard. Keep in mind that the thicker the material the more you have to cut to shape and glue rather then fold and glue. If you do take it a step further and go for the sheet styrene model, varying thickness are required since I lack a CNC machine I build up layers on the model, enough to create armor segments and other details. I usually start with styrene that is 1mm thick, because I stumbled on to a treasure trove of it, look at your local art supplies stores most of the paper displays will have styrene sheets to support the paper and the vendor will usually part with it for little or no cost. Depending on the thickness and details I try to build a sturdy model, anything less them a half-millimeter flexes a great deal and makes the models all wobbly. Ps. got a Line on thunder hawks anyone need that one, will post a comment block on my blog. Happy to answer any question that I can.